On July 1, 2004 Rep. Eddie Bernice Johnson (TX-30) and a group of other Representatives, including Corrine Brown, Julia Carson, Joseph Crowley, Elijah Cummings, Danny Davis, Raul Grijalva, Michael Honda, Carolyn Maloney and Jerrold Nadler, sent a letter to United Nations Secretary-General Kofi Annan requesting that the U.N send election observers to monitor the November 2, 2004 presidential election. On July 8, Johnson wrote Secretary of State Colin Powell and asked that he request UN election observers. On July 15, 2004 the House debated a Republican amendment to "prohibit funds from being used to request the United Nations to monitor the election;" the idea of UN observers did not advance. However, in response to Johnson's July 8 letter, a State Department official wrote back indicating that the Department has invited the Organization for Security and Cooperation in Europe's (OSCE) Office for Democratic Institutions and Human Rights to send an election observation mission. On September 8, 2004 OSCE Chairman-in-Office, Bulgarian Foreign Minister Solomon Passy appointed OSCE Parliamentary Assembly Vice-President Barbara Haering of Switzerland as the special coordinator to lead the mission. (>) Rita Süssmuth of Germany heads the Election Observation Mission, which set up in Washington, DC on October 11 with 10 staff. Plans called for 75 observers to arrive on October 28 and deploy around the country in teams of two. The OSCE/ODIHR Election Observation Mission issued a preliminary statement [PDF] on November 4 noting that "Election Day proceeded in an orderly and peaceful manner," but citing a range of concerns on such matters as voting rights of felons, provisional ballots, and long lines. 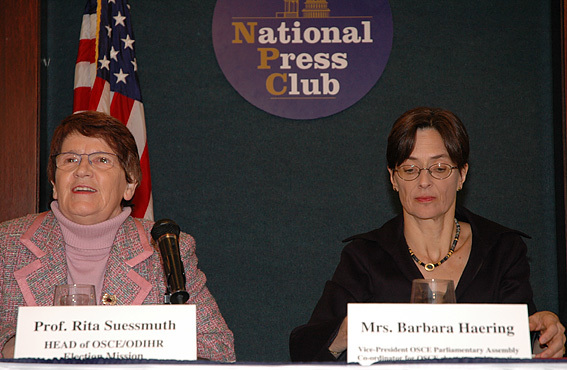 Nov. 4, 2004--Rita Süssmuth and Barbara Haering discuss the preliminary findings of the OSCE/ ODIHR Election Observation Mission. In addition to the OSCE group, the San Francisco-based Global Exchange, "an international human rights organization dedicated to promoting environmental, political and social justice," has organized an independent election observer team. A pre-election team of twenty members, representing countries from Argentina to Zambia, arrived in mid-September 2004 for an initial survey and visited Arizona, Georgia, Florida, Missouri, and Ohio. The Fair Election team will pay particular attention to three points: "evidence that minority and poor voters are disproportionately disenfranchised;deep disagreements over the security of millions of votes recorded on computer voting machines; and concerns about the consequences of corporate and personal wealth in political contests." Fair Election issued a 46-page pre-election observation report "Election Readiness: It is Never too Late for Transparency" [html, PDF] in October 2004.